Looking for fast facts about King Tut? Check out these fast, interesting, important and even little known facts about the famous pharaoh of Ancient Egypt - the Great King Tut - Tutankhamun. Fact 12 - On 5 November 1922 Howard Carter cables Lord Carnarvon: "At last have made a wonderful discovery in Valley; a magnificent tomb with seals intact; re-covered same for your arrival; congratulations." The Ancient Egyptians believed that as long as a pharaoh's name was remembered, the king would live on through eternity. 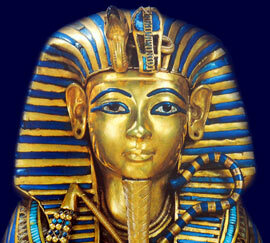 The discovery of the tomb of King Tut has ensured that Tutankhamun is one Egyptian Pharaoh who will never be forgotten.